In light of the 2005 Centre County Affordable Housing Needs Assessment and the steady increase in residential sales prices in Centre County, several housing stakeholders sought to address the need for affordable housing for low and moderate income households. In response to this need, Centre County Housing and Land Trust (CCHLT) was incorporated in the summer of 2007. Founded through the partnership of five local housing organizations (Habitat for Humanity of Greater Centre County, Housing Authority of Centre County, Housing Transitions Inc., State College Borough, and State College Community Land Trust), CCHLT’s goal is to better serve the housing needs of low to moderate income households in Centre County through long-term affordable housing. We focus on: developing and overseeing of affordable housing; providing budget and pre-/post-purchase homeownership counseling; working with for-profit/non-profit developers; and working with local municipalities on affordable housing issues and implementing their affordable housing policies. In August 2011, CCHLT commissioned a Housing Market Study for Centre County that was conducted by Mullin & Lonergan Associates. From the Housing Market Study, it was recommended that we continue to create a portfolio of homes that are affordable to working households earning up to 120% of the Area Median Income for Centre County. We should focus our efforts primarily in the Centre Region (i.e., College Township, Patton Township, Harris Township, Ferguson Township, and Halfmoon Township). The Centre Region is an active real estate market where demand is strong and values are increasing. In general, affordable sales housing should be within easy commuting distance of State College and accessible to public transportation. CCHLT completed the 14-lot community, Thompson Place, in Patton Township with two new single-family homes constructed in 2016. This community has been built in collaboration with Habitat for Humanity of Greater Centre County. At completion, the community consists of eleven single-family homes, two duplexes, and one mobile home. Today, each of the five founding organizations maintains one representative serving on our Board of Directors. Board members are also active in our committees providing added expertise and support. As a community land trust, our team represents the diversity we strive for as a community with members from the general public, community organizations, public officials, and our residents. Join our email list and stay connected. Get the latest on all CCHLT news, events, and updates! Amazon will donate 0.5% of the price of your eligible AmazonSmile purchases to Centre County Housing and Land Trust whenever you shop on AmazonSmile. AmazonSmile is the same Amazon you know. 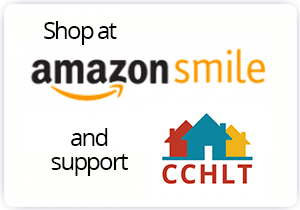 Start shopping today, & support CCHLT!